This is my 14th year of teaching and I have never worked in a more exciting and dynamic environment than a dual language program. Partly because we’re creating it as we go, but also because as a staff, as a group, people are so willing to try new things, to share materials, and the kids seem to always be in the forefront. This is the first time I’ve worked with this combination of things in one place. This quote is the response from a second grade dual language teacher during a focus group discussion when teachers were asked how things were going with their program. 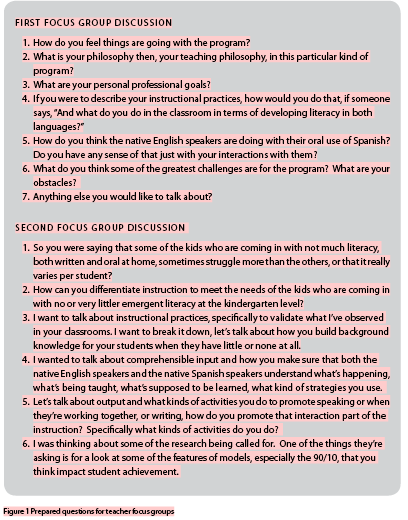 The excerpt from the focus group discussion above is part of a larger data set from a dual language immersion (DLI) program evaluation study that is being conducted at Cecile Trost Elementary School (Trost), in the Canby (OR) School District (CSD). Trost is located 25 miles south of Portland, Oregon. The DLI program functions as a strand within the school and follows an 80/20 model with Spanish as the partner language. At this time, the program has one kindergarten classroom and two DLI classrooms at each grade level through fifth grade with approximately 25 students in each class. A steering committee has recently begun collaborating with a middle school in the CSD to prepare for future implementation of DLI at this level. The study began in April 2007, and will continue for at least five years in order to document longitudinal student achievement data. At the time the evaluation began, the DLI program was in its third year of implementation and administrators, teachers, and parents had many questions about its effectiveness, especially in terms of promoting students’ literacy growth in English. The three purposes of the evaluation include: 1) documenting how well the program is being implemented, 2) improving program implementation, and 3) informing administrators, parents, other staff, and the community about the program’s effectiveness. We used the Evaluator’s Toolkit for Evaluating Dual Language Immersion Programs (Lindholm-Leary & Hargett, 2006) to assist in program evaluation. This tool, designed to help create high-quality programs, gives clear step-by-step suggestions and examples for conducting a thorough evaluation. Information provided here revolves around the theme of collaboration that emerged from data collected during the first year of the evaluation, between April 2007 and April 2008. The theoretical framework for this evaluation is based on The Guiding Principles for Dual Language Education: A Review of Research and Best Practices (Howard, Sugarman, Christian, Lindholm-Leary, & Rogers, 2007), a document that provides an extensive review of research on favorable characteristics of programs that lead to academic success for English language learners (ELLs). This evaluation study was conducted using a mixed-methods design. Three research questions were developed to guide the evaluation: (a) What kinds of progress have students in both language groups made in their oral, reading, and written proficiency in each language? (b) What are teachers’ perceptions of the effects and benefits of the program? (c) What instructional practices are used in the program? Nine DLI teachers (K-fourth grade), the principal, and two ESL teachers participated in the study. To answer the first question, student assessment results from The Developmental Reading Assessment (DRA, K-3, Beaver, 2006), the Evaluación del Desarollo De La Lectura 2 (EDL, Ruiz & Cuesta, 2007), the state required English Language Proficiency Assessment (ELPA), and the Oregon Assessment of Knowledge and Skills (OAKS) were collected by the teachers. The next two research questions were addressed with a mix of quantitative and qualitative data. Quantitative data included participant responses to a questionnaire. Qualitative data comprised focus group discussions, one-on-one interviews and classroom observations. Quantitative data were analyzed using Excel spread sheets and simple statistics. Qualitative data were analyzed using codes, identifying themes, and developing theoretical constructs, procedures recommended by Auerbach and Silverstein (2003). Five focus group discussions have been held since the beginning of this study. These discussions have provided evidence of teachers’ satisfaction with the program, attitudes toward the program, level of and additional needs for training, and instructional practices (Lindholm-Leary & Hargett, 2006). Focus group discussions were digitally recorded and transcribed into a word processing program for qualitative analysis. Each focus group discussion lasted between 45 and 60 minutes and was held after school. Each discussion focused on a theme, either at the request of the teachers or based on issues raised during previous discussions. For example, the most recent discussion focused on writing, because the fourth grade teachers expressed concern about developing this skill in light of the upcoming state standardized fourth grade writing assessment. Questions and topics were prepared for each discussion, but questions and topics also emerged depending on the direction the discussions took (see Figure 1 for prepared questions). All teachers who participated in the discussions were given the word-processed transcriptions for validation. Teachers also completed a survey questionnaire provided in the toolkit (Lindholm-Leary & Hargett, 2006), to help triangulate data regarding satisfaction with the program, attitudes toward the program and other staff, and level of and additional needs for training (2006). Teachers used Likert scales to rate themselves on their educational and professional background, and their teaching practices and beliefs. The questionnaire for teachers is comprised of two sections. The first section contains sixteen statements that require teachers to rate their level of training from one (no training; no knowledge) to five (training; very knowledgeable). The second section contains thirty-one statements that ask teachers the extent to which they agree or disagree with the statement on a one (strongly agree) to four (strongly disagree) scale. The mean was calculated for each statement on the questionnaire across the seven teachers and bar graphs were created to display the mean score for each statement. Since the evaluation study began, twenty-one half-day classroom observations have provided information about program implementation. Classroom observations varied in terms of length of time dependent upon the teacher’s schedule and instructional plans for the day, respectively. Observations were spread across all grade levels, including kindergarten, first, second, third and fourth grades. The foci of the observations were the teachers’ instructional practices and students’ use of the language of instruction. Observations were recorded through hand-written field notes in a running record format. Notes were word-processed and copies given to each teacher for confirmation. Analysis of focus group discussions, responses on the questionnaire, and classroom observations revealed that teachers view collaboration as the key ingredient of their program. Teachers described collaboration as involving the (a) sharing of the same vision and goals and adhering to the same philosophy, (b) creating curriculum together, and (c) implementing similar instructional practices. All of these program features contribute to the benefits of uniting the school’s two language groups and creating an exciting teaching environment that has resulted in strong job satisfaction. I think about our goals in the program that these students will become bilingual, bicultural, biliterate, and I think we all really share that, and because we believe that our lessons promote it, we’re always trying to get students to act biculturally, and pairing students so they’re interacting with different types of learners. When teachers were asked what features of their program contribute to student achievement, they talked about holding high expectations for all students. Teachers said they expect “everyone to produce” and have observed that their students “expect to learn.” One teacher clarified, “That’s something I’ve really been impressed with, is how positive people are about the students and how expectations are for all the students.” The GP state that the shared belief that all children can learn “is a central operating principle that empowers students, especially English language learners” (p. 24). Teachers’ high expectations for success among all students in the Trost DLI program have created a positive school environment. This assertion is supported from observations that showed DLI classrooms as a place in which teachers and students demonstrated respect for each other, accepted mistakes as a part of the learning process, and gave each other constructive feedback and support during learning tasks. The GP recognizes that holding high expectations of ELLs means providing them with enriched instruction (2007). Classroom observations revealed all Trost teachers implementing thematic instruction characterized by the in-depth investigation of a concept with stress on the understanding and use of academic vocabulary. According to the GP, “successful schools and programs have a curriculum that is clearly aligned with standards and assessment” (Howard et al., 2007, p. 10). The DLI teachers at this school develop curriculum together by first identifying standards that should be met by the end of a unit of instruction. Teachers use curriculum mapping by analyzing Oregon science and social studies standards and comparing them to district standards. Content themes are then chosen at each grade level based on standards. Themes, such as “Community,” “Heroes,” and “Habitats,” guide academic language and literacy instruction. Thematic curriculum design is an outstanding strength of the DLI program; teachers believe this makes their instruction more meaningful and in-depth. The CSD administration has played a role in allowing teachers to have autonomy to build curricula. Teachers were able to choose supplemental materials that met specific needs of their students for language arts that are directly connected to all standards. Effective curriculum development headed by teachers is a feature of successful programs that crosses over into several strands of the GP. For the Trost DLI teachers, autonomy to build curricula breeds positive feelings about working in the program. Trost DLI teachers characterized collaboration as sharing the same goals and philosophies, creating curriculum together, and using similar instructional practices. As noted, many of the teachers’ beliefs and practices are aligned with the GP. The “staff quality and professional development” strand of the GP connects successful DLI programs with highly qualified teachers (Howard et al., 2007). All Trost DLI teachers are proficient in both English and Spanish, have their ESL endorsement, and have received training in the Guided Language Acquisition Design (Project G.L.A.D., 2009) model or Sheltered Instruction Observation Protocol (SIOP, Echevarria, Vogt, & Short, 2007) teaching framework. On the questionnaire, teachers rated themselves highly on their training and knowledge regarding bilingual education. The areas that resulted in the highest means (4.8 and above, out of five), included knowledge about theories of second language development, knowledge of sheltered instructional strategies in both languages, and integrating multicultural content into instruction. According to the GP, teachers with bilingual credentials are more apt to be positive about their teaching environment and view the program as equitable (2007). Findings from this study dovetail with this claim as the teachers reported two benefits of their collaboration: more unity between language groups and the creation of an exciting teaching environment. For someone who has taught in the classroom for awhile, I think it’s kind of a power thing, of who has power in the classroom, and it’s obvious that it’s shared between all kids, and not one group of kids has power over another. It’s about ownership and motivation and willingness to put themselves out there to learn. On the questionnaire, all teachers disagreed with the statement that their program better serves the needs of English speakers than ELLs; all agreed that both languages are equally valued throughout the program, and all agreed that particular consideration is given to elevating the status of the minority language. Equity carries over to the parents also. One teacher spoke passionately. “I think we’ve set high expectations for our parents, we have done so by going to their homes, but I feel we also hold them accountable.” She mentioned that they give parents suggestions for how they can help their children with homework and ask parents to assist their children with reading at home. One teacher explained that “culturally, it’s a bridge that we’re creating for knowing what the school system is like here and that they have that power and that right to come into the schools.” According to the GP, when parents are involved with the school and sense the value of their involvement, their children achieve higher academic success (Howard et al., 2007). Trost teachers have collaborated to gain community support for their program through communication and holding high expectations. Teacher collaboration is a fundamental feature of the Trost DLI program and plays a crucial role in the quality of the program. Trost teachers define collaboration as the sharing of the same vision, goals, and philosophy, creating curriculum together, and implementing similar instructional practices. Benefits of this collaboration include equity between language groups and working in an exciting teaching environment. Collaboration serves as a form of professional development for the teachers, because they learn from each other about students’ strengths and needs and how they can address those needs. Teachers claim that collaboration has given them ownership of the program, that is, they use their professional knowledge to make decisions based on needs of students. This has resulted in a work environment that the teachers find satisfying and stimulating. The evaluation study found that the lack of a DLI program coordinator at Trost means the teachers take on roles and responsibilities beyond their contractual duties. Because the needs of students are in constant flux and the program continues to expand, time for collaboration needs to be ongoing and built into the teachers’ work schedules for the program to fully realize its potential — bilingual and bicultural children who are academically well-prepared.